Star Wars Rebels: Complete Season One delivers all 15 action-packed episodes plus never-before-seen bonus material and cast/crew interviews revealing the magic behind the making of the hit series. Releasing on Blu-ray and DVD on September 1, this is a must-add collection to the library! 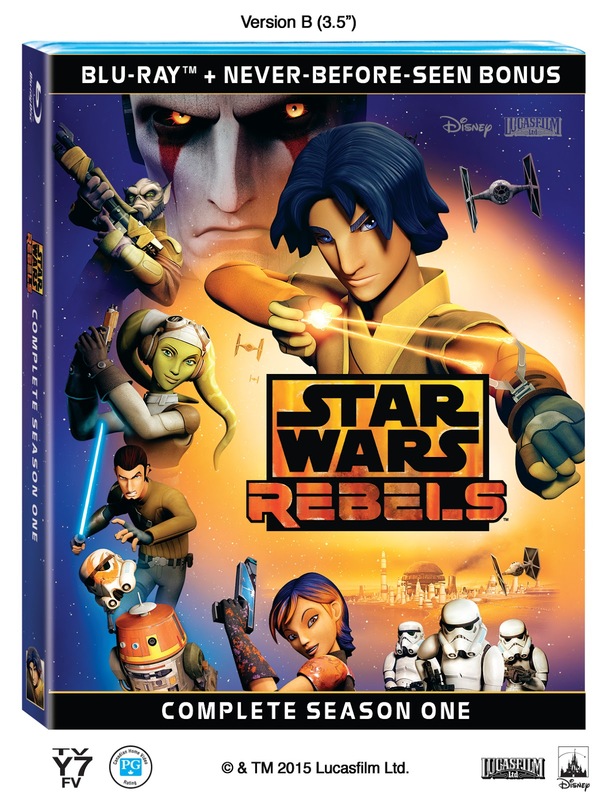 In the first groundbreaking season of Star Wars Rebels, young hero Ezra Bridger joins the clever but motley crew of the starship Ghost in their resistance against the Empire. As the series begins, Imperial forces have occupied a remote planet, ruling with an iron fist and ruining the lives of its people. Ezra and his new rebel friends -- Hera, Kanan, Sabine, Zeb and Chopper -- embark on daring adventures in their fight against oppression across the galaxy, receiving help from familiar heroes such as Lando Calrissian, Ahsoka Tano, and Jedi Master Yoda. Pursued relentlessly by the Imperials and a Jedi hunter called the Inquisitor, this tenacious ragtag band of rebels will find itself in the crosshairs of none other than Darth Vader when season one closes in a shocking two-part finale. Star Wars Rebels is created by Dave Filoni (“Star Wars: The Clone Wars”), Simon Kinberg (“X-Men: Days of Future Past,” “Sherlock Holmes”), and Carrie Beck. The Lucasfilm Animation production is also executive-produced by Filoni and Kinberg as well as Greg Weisman (“Gargoyles”). Featuring the voices of Freddie Prinze Jr. (“I Know What You Did Last Summer”) as Kanan, Vanessa Marshall (TV’s “Young Justice”) as Hera, Steve Blum (“The Boxtrolls”) as Zeb, Tiya Sircar (“The Internship”) as Sabine, Taylor Gray (TV’s “Bucket and Skinner’s Epic Adventures”) as Ezra, David Oyelowo (“Selma”) as Agent Kallus and Jason Isaacs (“Harry Potter”) as the Inquisitor. New episodes of Star Wars Rebels Season Two premiere this fall on Disney XD. Lucasfilm Ltd., a wholly owned subsidiary of The Walt Disney Company, is a global leader in film, television and digital entertainment production. In addition to its motion-picture and television production, the company's activities include visual effects and audio post-production, cutting-edge digital animation, interactive entertainment software, and the management of the global merchandising activities for its entertainment properties including the legendary STAR WARS and INDIANA JONES franchises. Lucasfilm Ltd. is headquartered in northern California. Lucasfilm, the Lucasfilm logo, STAR WARS and related properties are trademarks and/or copyrights, in the United States and other countries, of Lucasfilm Ltd. and/or its affiliates. STAR WARS © & TM 2015 Lucasfilm Ltd. All Rights Reserved. All other trademarks and trade names are properties of their respective owners.